When the sabermetric revolution hit baseball, predictive statistics like WHIP (walks and hits per inning pitched) and OBP (on-base percentage) emerged. Later, more in-depth metrics like OPS (on-base plus slugging percentage) developed to describe a batter’s efficiency and power at the plate, discounting things like game situation, and sacrifice and base-running ability. There exist similar metrics to describe the general and the specific in the world of green computing. The Green 500 list is ranked on Megaflops/Watt, a statistic that considers the entire supercomputing operation. Like OPS, PUE (Power Usage Efficiency) measures power and efficiency where the datacenter is their plate, so to speak. Such calculations require a slightly more intricate reporting system. Further, determining which outputs are IT intensive and which are slightly more subjective. The baseball/OPS analogy falls apart here as the parameters for on-base percentage and slugging percentage are rigidly defined. However, the purpose of the report is to indeed define those parameters in a rigid fashion. The calculation on its surface is relatively simple: divide the total datacenter facility energy consumption by that of the IT processes. The closer the number is to one, the more efficient the datacenter is at appropriating its power to IT, the purpose of the datacenter in the first place. That description constitutes what would be to TGG a Level Two reading level. To distinguish between a one-time monthly measurement in just a few places and a more sophisticated model brought about by more continuous measurement in different levels of the datacenter and facility, TGG developed a three-level system. TGG developed PUE along with an inverse metric DataCenter infrastructure Efficiency (DCiE) in 2007. According to TGG, PUE gained traction in the industry, presumably because it was simpler to compare a number scale from one to infinity than one to zero. Since, the statistic has seen usage from both the US-based Data Center Metrics Coordination Task Force and the worldwide Global Harmonization of Data Center Efficiency Metrics Task Force. To be eligible to be graded on the PUE scale, a facility must measure its power monthly over the course of a year. However, to garner more accurate and legitimate results, they suggest measuring daily or even multiple times a day to account for all different environmental factors, including time-dependent data demand as well as variable seasonal and daily cooling requirements. With that said, the point of PUE, as TGG put it, is to increase awareness of one’s own datacenter efficiency versus winning a statistical measure. “The common goal is to reduce energy usage, not manipulate a metric,” TGG argued. Like a baseball agent manipulates his player’s statistics to gain an advantage in the negotiating room, some organizations manipulate their supercomputers such that they gain recognition and press from the Green 500 list. Since PUE has yet to become a tool for organizing machines and centers to the acclaim that Megaflops/Watt has, the manipulation of this metric is less likely. Indeed, for the most part, TGG is wary of using PUE to compare and contrast data facilities. However, the natural proclivity to do so has prompted this effort to enlighten those in the differences that must be taken into account. For example, data centers come in many flavors, from the type of processing they do to the amount of time they have been operational and even their location and resulting surrounding climate. “In some real-world situations, the PUE metric may go up if the total energy provided to a data center is not adjusted accordingly to match a drop in IT energy. 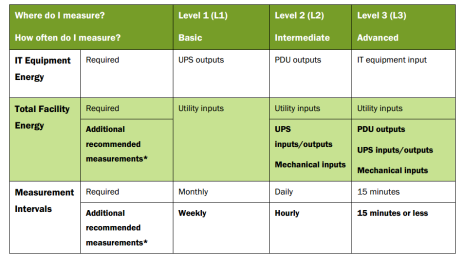 It is important to remember to reduce the infrastructure subcomponent energy consumption.” Those subcomponents can be properly evaluated if a facility implements Level Two or Three measure, as denoted by the figure below. According to TGG, a comprehensive list of datacenter PUE’s has yet to be compiled. However, they believe that while many centers have ratings of 3 are higher, 1.6 should be possible. Indeed, research done by Lawrence Berkeley National Labs noted that 22 datacenters had values from 1.3 to 3.0. Below is a representation of a calculation done by TGG to help put those values of 1.3 and 3.0 in context. First of all, not all energy is treated equally. Purchased electricity is treated normally while electricity generated internally, whether it’s bought or manufactured, carries a lower weight. Natural gas holds a co-efficient of 0.35 in this calculation. When combined with the electricity bought, the IT energy co-efficient comes to 0.90. The total facility calculation is pretty simple once the moderators are applied. That is divided by the adjusted IT energy to get a Power Usage Efficiency of 1.57. Despite these challenges, calculating datacenter efficiency is important. Collecting the appropriate measurements at the correct intervals can give facilities the ability to crack down on unnecessary energy loss, and PUE just may be the metric to help do that. Are Clouds the Fastest Path to Green Computing?